A couple years ago I posted this recipe for blueberry quinoa muffins. Even back then when I could count my blog readers on one hand, the recipe took off on Pinterest. Even today, it's one of my most saved Pins. Who would have thought? I have gotten some feedback on the old recipe from a few people. But since I haven't made the recipe in a while, I didn't really feel I could offer much advice (or come to my own defense!). It was time to go back to the drawing boards and retry the recipe! A couple people mentioned that the original recipe resulted in soggy muffins. Who wants a wants a soggy muffin? Definitely not this girl, so clearly something had to change. The first thing I thing I did differently was blend half the quinoa into a flour to mix with the rest of the dry ingredients. I cooked the rest of the quinoa, just like in the original recipe, but this time I used milk! While this also helped reduce the sogginess, it also had another unintended consequence. A good consequence, I should add! You know that distinct nutty flavor quinoa has? Well the milk really helped tame that flavor a bit. And let's be honest, no one is out there craving a muffin that tastes like quinoa. Other than these couple steps, I didn't change a whole lot else about the recipe. I mixed the quinoa flour with whole wheat flour, all purpose flour, sugar, and baking powder. To that I mixed in all the wet ingredients - the remaining milk, apple sauce, eggs, and coconut oil - until it formed a thick batter. That's when I folded in the cooked quinoa. 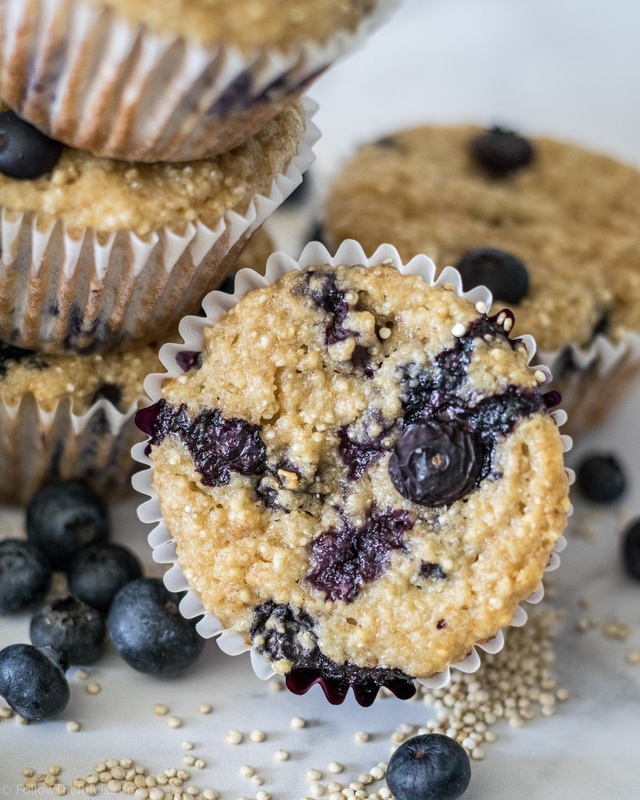 Now these blueberry quinoa muffins wouldn't be blueberry quinoa muffins without blueberries. Actually, they don't have to be blueberry muffins. They can be any berry you want, or no berry at all. But I wanted to go with the classic blueberry! So I mixed the clean blueberries into the batter until they were evenly dispersed throughout. I would recommend, however, that you toss the berries in a bit of flour before mixing in (unlike me). This will help prevent the berries from sinking to the bottom of your muffins. After a quick bake, these muffins were ready to be scrounged up. You might think from the photo above that I artistically arranged the muffin tin so that I could highlight both the blueberries and the quinoa. Nope. I just had some muffin tins to fill after eating a couple muffins before I could remember to take pictures. Self control has never been my strength. I am definitely a fan of the quinoa muffin recipe 2.0. The texture is much more like a traditional muffin - light, airy, and slightly moist. The quinoa flavor isn't as distinct, which I think would turn a lot of people off to this recipe. But it is still super healthy! There is much less sugar in this recipe compared to my traditional muffin recipes. Also, the quinoa adds some extra protein, which makes it a great, well-rounded breakfast! I would love to hear from anyone who made the original recipe and how you think this recipe compares! Let me know which one you like better! I certainly know which recipe I would vote for! Place a small sauce pan over medium heat. Add 1/4 cup of the quinoa and lightly toast for a couple minutes. Pour in 1/2 cup milk and bring to a simmer. Reduce heat and cover pan with a lid. Cook for about 15 minutes, until all the milk has been absorbed. In a blender, food processor, or spice grinder, process the remaining 1/4 cup quinoa until it becomes a fine flour. Mix the quinoa flour with the other flours, sugar, baking powder and salt in a large bowl. In a separate bowl, whisk together 1/4 cup milk, Greek yogurt, apple sauce, coconut oil, egg, and vanilla. Pour wet ingredients into dry and mix until just combined. It's okay if there are still some lumps in the batter. When quinoa is cooked and slightly cooled, mix into the muffin batter. Fold in the blueberries until evenly disbursed. Spoon about 1/4 cup of batter into a prepared muffin tin. Bake muffins for about 20-25 minutes, or until a toothpick inserted into the center of a muffin comes out clean. Remove from oven and let cool in the muffin tin for 5 minutes before transferring to a cooling rack.